Interview with François Villeroy de Galhau, Governor of the Banque de France and Member of the Governing Council of the ECB. Mr. Villeroy de Galhau, what do you think is the greater risk at the moment: that the European Central Bank (ECB) will fail in managing a smooth exit from its ultra-loose monetary policy or that European politics will fail in delivering the necessary reforms to strengthen the eurozone? I am fully confident that we will succeed in managing a smooth exit. As for the second risk, that's not in our hands but we have been advocating a strengthening of the eurozone. Let's stay with monetary policy first: The euro area economy is growing at the fastest rate in ten years. Inflation, at 1.4%, is within the reach of the ECB's target of below, but close to 2%. However, the ECB’s policy is even more expansionary than in the global financial crisis. That does not really fit together? The euro area economy indeed offers a very positive picture as the year begins. Growth is robust and picking up speed. But inflation is still lagging behind. Our mandate here is simple and univocal: price stability. And we have a clear definition of price stability, similar to that of all major central banks: an inflation rate of below, but close to 2% in the medium term. We have to stick to our mandate, in line with German virtues. So, the policy is appropriate? We have not yet reached our inflation target and not in a self-sustaining way. So, the eurozone still needs an accommodative monetary policy. At the same time we are getting closer to our target. That means we can gradually reduce the intensity of our monetary policy support. In that sense, we made a very important decision at the end of October. You are referring to the extension of the asset purchase program (Quantitative Easing, QE) until at least the end of September 2018, with a monthly purchase volume halved from 60 billion euros to 30 billion euros from January on. By reducing our volumes by half, we can say that we have started a gradual normalisation of our monetary policy. In December, inflation again surprised to the downside, with the core rate excluding energy and food remaining at 0.9%. How disappointing is that from the point of view of the ECB? We have a medium-term target and we do not look only at individual monthly figures. These data do not change our increasing confidence that inflation is heading in the right direction. The only question is how long it will take to meet our target. On this issue, the recent evolution of the exchange rate is a source of uncertainty which requires monitoring with regard to its possible downward effects on imported prices. With the increases and decreases of the QE purchase volume, the ECB policy seems to be trying to fine-tune inflation - which, however, must fail? We are not “fine-tuning” inflation. At the beginning of 2016, we increased purchases from 60 billion euros to 80 billion euros, because at that time there was a risk of deflation. In 2017, we clearly stated that this danger of deflation had disappeared. That was a first success of our monetary policy. Now inflation is tending to pick up. This, too, is to a large degree the result of our monetary policy. The Governing Council is in complete agreement on this point. Moreover, it is crucial not to look only at the net purchases. It's about our whole package. It includes the sizeable stock of acquired assets and the forthcoming reinvestments, the current levels of our key interest rates as well as our forward guidance on future interest rates. Our monetary policy relies on a quartet of instruments, not on a solo. If net purchases are playing an increasingly minor role, why is the ECB’s Governing Council making such a big deal out of whether or not to continue buying for a few more months after September? This is also why markets are very much focused on this element. We did not say anything about what will happen after September. We took a decisive step towards the possible end of our net asset purchases, but all the scenarios that are circulating are pure speculation. And our monetary policy is not driven by market expectations. With this very gradual normalisation, isn’t there a great risk of being too cautious – of falling "behind the curve"? No. If you take into account the whole range of instruments I mentioned earlier, there is the prospect of a credible exit strategy when appropriate, sequencing the end of our net purchases, the rise of our key interest rates, and later the reduction of our reinvestments and thus of our stock of assets. We are predictable as to the direction of our policy and the sequencing. But we are not pre-committed in terms of precise timing. We will make this contingent on the actual progress made in achieving our inflation objective. If growth and inflation are evolving in line with ECB projections, will October's QE renewal be the last one? We still have six monetary meetings to decide till September. Be patient! ECB Executive Board Member Benoît Cœuré has spoken of a "reasonable chance" that QE will end after September. Would you agree? I never comment on what my colleagues say. I only give my personal assessment of the situation. The ECB wants to raise interest rates only "well" after the end of the net purchases. But it is completely unclear what that means: Many experts predict interest rate hikes only at the end of 2019, but others at least a first increase in the negative deposit rate by the end of 2018. Isn’t there a need for the ECB’s Governing Council to provide more clarity? Our monetary policy in 2017 was one of the most predictable of all. And the same is true now: we have given clarity on our purchases for nine months and for an even longer period of time on our interest rates. But how do you explain the different expectations? Nominal interest rates will rise in the future; real interest rates will remain very low and favourable for the economy. But we cannot pre-commit on our monetary policy for the next year or two: the timing and the pace of future rate hikes will be dependent upon the inflation outlook. How long can the ECB stick to zero and negative interest rates without creating risks for financial stability? So far, our interest rate policy has not created risks for financial stability as a whole, or for the profitability of banks. The more robust economic situation, which is partly due to our policy, is positive for the banks. Negative short-term interest rates also contribute to a steeper yield curve. This helps financial institutions in their process of maturity transformation. Overall, banks should not exaggerate the importance of the negative deposit facility rate for their profitability. In the euro area, the profitability of banks is very different across countries, although all operate with the same exact monetary policy. In Italy or Germany, profitability is much lower than in the Netherlands or France. There are obviously structural reasons for this - and they have to be resolved by the banks themselves. Nevertheless, the negative interest rate is an unconventional instrument and it has its limits. We will have to get out of negative interest rate territory someday. Some experts say the ECB will never be able to meaningfully raise interest rates again. Many euro states are so heavily indebted that rising interest rates would bring back the euro crisis. I cannot accept this argument at all! That would mean that we are not independent from governments. We are fully independent: we have proved this again and again since the founding of the Eurosystem in 1999. We have always raised interest rates when needed. We will also decide completely independently on the normalisation that has now begun. So the states should not rely too much on the ECB? To put it bluntly, the level of our key interest rates is not and will never be determined by the level of government debt, but solely by our mandate on price stability. Many critics say that the ECB is no longer concerned with inflation, but with the cohesion of the eurozone - especially because ECB President Mario Draghi promised this cohesion in the summer of 2012 with his "Whatever it takes". Anyone claiming that would be wrong. It is true that Mario Draghi said that back in 2012 and, by doing so, was successful in protecting the currency - which is our mission. At the moment, the euro is not in danger. On the contrary, the eurozone is stronger today than before. Public confidence is also higher than ever: 74% of citizens in the euro area countries support the euro. In Germany it is even 81%. … is Draghi sometimes asking you for advice on why there is this harsh criticism of the ECB and of him - and what he should do? No. However, I am often invited to Germany, and I like to come to discuss our monetary policy. Our policy is not about a dovish or hawkish stance that would have to do with a particular nationality. It is about pragmatic and independent decisions, solely determined by our mandate. But how dangerous is it when the criticism of the central bank is so great in the largest eurozone country? Germany has always insisted on the independence of the ECB - and rightly so, in line with the tradition of the Bundesbank. Our monetary policy is not determined by political or public opinion. If so, we probably would not be able to do our job. We do what is needed - and that is the case when inflation is too high, but also when inflation is too low. Let's come to the future of Europe and the eurozone. The ECB is pushing for a "quantum leap" in integration. How big is the frustration about the lack of progress? First of all, that is the responsibility of the European governments and institutions. It's about democratic decisions. But our interest is very clear: monetary policy should not be overburdened and should not be "the only game in town", as it is often called. We all agree on that. Without further progress, the ECB will continue to be the central actor in crisis times. Twenty years ago we agreed on an Economic and Monetary Union. One pillar, monetary union, is effective and robust. The other pillar, economic union, is underdeveloped. That's the problem. Is the monetary union really a full success? The former ECB chief economist Otmar Issing says the euro may have created more division than unification. I do not share this assessment. Sure, achieving the monetary union has not always been an easy and quiet process. But you should not idealise the period before Maastricht. There were heated discussions. The fact that, today, three-quarters of citizens support the euro, says a lot. They are satisfied with and even proud of their currency. So we have achieved something together! What are your ideas for the economic union? We need stronger economic instruments to be able to face the next recession. The current cycle will end sometime, even if it is very robust now. Without such new instruments, monetary policy will remain the only game in town. So if you want to prevent monetary policy from being overburdened, you must strengthen the economic union. These are two sides of the same coin. This must be clear to everyone. There are many worries in Germany which I understand. But the economic union is not about Eurobonds. It's not about a transfer union. It is not about a mutualisation of debt. But we have to arm ourselves better. The most important thing remains reforms at country level. If more integration were to serve as a substitute for necessary national reforms, that would be completely wrong. The bulk of the responsibility will remain at the national level. We will not go as far as a single economic policy. But there are areas where we can do better together. The first step needed is a "Financial Union for Investment and Innovation" in the euro area, which I already advocated with Jens Weidmann. We have an annual surplus of savings of 350 billion euros. At the same time, we have major investment needs in key areas - such as digitisation or the scaling up of SMEs. But we do not bring resources and needs together well enough. The second is better macroeconomic coordination. As an example, if countries like France implement more reforms, countries like Germany could use part of their domestic room for manoeuvre, be it through higher public investment, higher wages or lower taxes for households. And later, as a third stage, some form of euro area budget capacity to fund common projects would make sense. That's where the German angst over a transfer union comes into play. Wrongly so, you would say? Such a budget would not be about transfers that always flow in one direction, from one country to another. It would be about common goods from which everyone benefits, such as energy transition or border protection. However, this third step can only come after the other two. Greek Finance Minister Efklidis Tsakalatos has said again that without Eurobonds and without financial transfers the monetary union will not work. I disagree. With all due respect, the key discussion is the Franco-German one to come. As I have said: I can understand many German reservations, but let us overcome the old suspicions and the old clichés. This discussion should not be about "German rules" versus "French spending". Look at France. I say it as a fully independent central banker: the new government is very serious about reforms and is acting with impressive speed. This is an important new element: Germany now has a reliable partner with France. The problem seems to be the other way around now: France is reforming and pushing for progress in Europe - but Germany is struggling with the formation of a government and is acting as a brake. Of course, not only Germany, but the whole of Europe will benefit from a stable government in Germany. But as central bankers, we are primarily concerned with the possible economic consequences of political risks: so far we have seen none for the eurozone, contrary to the UK with Brexit. But with regard to Euro reforms, Berlin is wasting time, right? The preliminary agreement of last week about a pro-European grand coalition was a good omen for the intensive Franco-German and European discussions to come. But the next steps, over the coming weeks, will depend purely on German political choices. But even in the German public there is little desire for more fiscal integration. Germany benefits from the euro, even more than any other country. We must and can find reasonable ways to strengthen the economic union without it leading to fiscal profligacy. You are calling for more fiscal stimulus in Germany. The German economy is already running at full capacity. Does it really need more stimulus – isn’t there a risk of an overheating? This will of course be a German decision. But there are strong domestic reasons for this: if you have full employment and a high current account surplus, pressures for higher wages are understandable. And everyone knows that public investment in Germany is low. The Fratzscher report stated in 2015 that there is an urgent need to catch up. And what about the risk of an overheating? We live in an open single market. There is little point in judging capacity only within national borders. When it comes to building or renovating roads or bridges in Germany, the risk of overheating remains limited, due to the fact that there are still spare capacities at the European level. You have praised the new pace of reforms in France. But there is less progress in consolidating finances. Progress has also been made in the area of public finance: in 2017, France met the Maastricht deficit ceiling of 3% for the first time in ten years. But only just so, with 2.9%. Yes, but still: complying with the 3% rule is an old French promise and the new government has delivered on it for the first time - and in its first year of government. But it's true: more needs to be done. For a further reduction in the deficit, a sustainable slowdown in public spending is crucial. That is less popular, but it has to be done. A very different, but very topical topic: How worried are you about the rally in Bitcoin and other cryptocurrencies - for example, when it comes to financial stability? Is there a need for a stronger regulation of the market? Blockchain is a promising technology; but bitcoin is in no way a "currency". It is a highly speculative asset. Its regulation makes sense only at an international level. But the potential risks for financial stability, and still more for anti-money laundering, make such regulation increasingly important. If you look at the criticism of the ECB in Germany - do you think a German ECB president could reconcile the German public with the ECB again? Support for the euro is currently at 81% in Germany, even higher than in the eurozone as a whole. The ECB does not seem to have done such a bad job! As for your question, the ECB Presidency is currently not an issue for discussion. We have an excellent president for the two years to come. You once said that for top EU posts it’s not nationality but competence that matters. Does that also mean that a Frenchman should not be excluded as Draghi's successor in 2019, only because there has already been a French ECB president before? What I said is obvious. But we have enough work to do to fulfil our mandate of price stability and to live up to our tasks of financial stability and banking supervision. We must not waste time with questions that are currently not pending, and that we do not have to decide on. 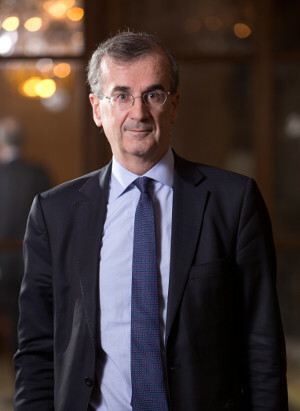 François Villeroy de Galhau is Governor of the Banque de France and Member of the Governing Council of the ECB.